All industries are different. Businesses may have similarities, but most present unique challenges. Our decades of metal stamping experience enable us to quickly identify your specific set of needs – and then work collaboratively alongside you to produce the parts and processes that best fit your business and industry. Our customers represent an array of local, national and global commercial businesses and industries. They come to us for comprehensive stamping services and they stay because we partner with them to deliver high-quality parts on time. We’ve also customized processes and parts for numerous automotive, agriculture, commercial appliance, electrical, machinery, off-highway, power transmission and safety applications. 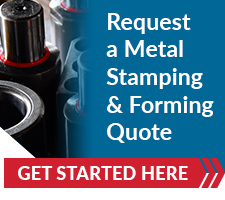 When you put our experience and short and medium run metal stamping expertise to work for you, you get a proprietary stamping process that produces the quality parts your business demands – without a doubt.